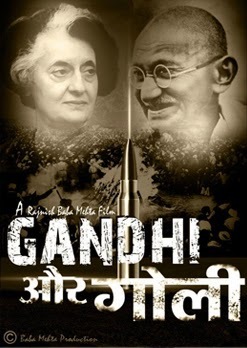 NMIFF welcomes the entry of a short film "GANDHI AUR GOLI" from India, DIRECTED by RAJNISH BABA MEHTA. "Short film \"Gandhi Aur Goli\" based on Shamim Karhani Poem\'s on Mahatma Gandhi. its complete ideology. In 1948 he composed a poem entitled \"Jagao Na Bapu Ko Neend Aa Gayi Hai\" just after the assassination of Mahatma Gandhi. The above poem had such an emotional appeal that it spread like the jungle fire. Once, Shamim Karhani had the opportunity to recite the poem in the presence of Pandit Jawaharlal Nehru, the first Prime Minister of India. Nehru, after listening to the poem, got impressed by Shamim\'s work and asked him to come to Lucknow to recite his poems in Congress election meetings. Later, after independence, Nehru asked Shamim to come to Delhi. He migrated to Delhi in 1950 and met Nehru at \'Teen-Murti\'. Nehru asked him to compose an epic in Urdu on the freedom movement of India and started giving him a stipend for the job from his personal pocket. Every Indian Think about Gandhi name....because 2 popular Gandhi Hit by Goli(BULLET).